Authorities say there is no reason to believe that the crash of the two trains is anything but an accident. 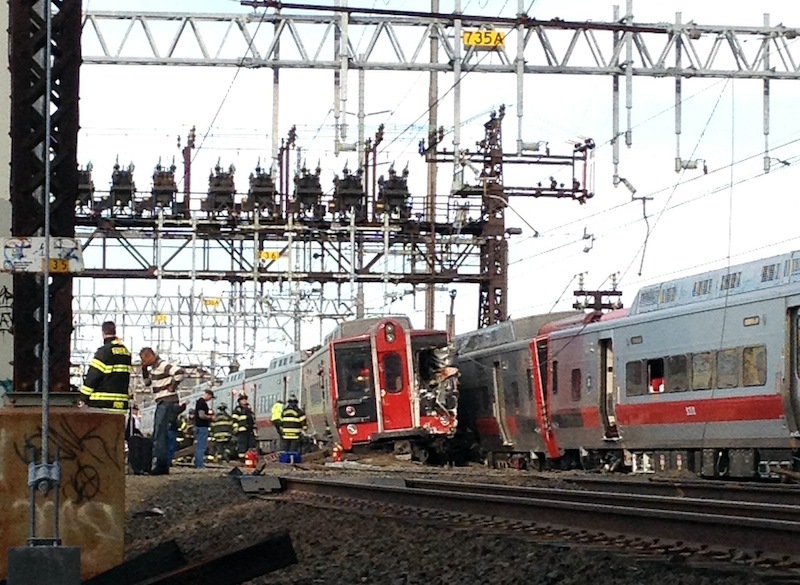 FAIRFIELD, Conn. — Two commuter trains serving New York City collided in Connecticut during Friday’s evening rush hour, sending 60 people to the hospital, including five with critical injuries, Gov. Dannel Malloy said. About 700 people were on board the Metro-North trains when one heading east from New York City’s Grand Central Station to New Haven derailed about 6:10 p.m. just outside Bridgeport, MTA and Bridgeport officials said. The train was hit by a train heading west from New Haven to Grand Central on an adjacent track, MTA spokesman Aaron Donovan said. Some cars on the second train also derailed as a result of the collision. Amtrak, which uses the same rails, suspended service indefinitely between New York and Boston. Lola Oliver, 49, of Bridgeport was riding one of the trains when the crash threw her from her seat. Oliver, a cardiology technician at Stamford Hospital, was treated at a hospital for cuts and bruises and released. Investigators Friday night did not know what caused the first train to derail. Malloy said there was no reason to believe it was anything other than an accident. The National Transportation Safety Board was sending a team to investigate. “We’re most concerned about the injured and ultimately reopening the system,” Malloy said from the scene about three hours after the crash. Passenger Bradley Agar of Westport, Conn., said he was in the first car of the westbound train when he heard screaming and the window smash behind him. “I saw the first hit, the bump, bump, bump all the way down,” he said. Agar had returned to work this week for the first time since breaking his shoulder in January. And since he was still healing, he thought it would be safer to take the train than drive. The Metro-North Railroad, a commuter line serving the northern suburbs, described it as a “major derailment.” Photos showed a train car askew on the rails, with its end smashed up and brushing against another train. Bridgeport Mayor Bill Finch said extra buses will be deployed, but the disruption caused by the train accident could cost the region’s economy millions of dollars. “A lot of people rely on this, and we’ve got to get this reconnected as soon as possible,” Finch said. The area where the accident happened was already down to two tracks because of repair work, Malloy said. Crews have been working for a long time on the electric lines above the tracks, the power source for the trains. He said Connecticut has an old system and no other alternate tracks. By late evening, Bridgeport Police Chief Joseph Gaudett said everybody who needed treatment had been attended to, and authorities were beginning to turn their attention to investigating the cause. The Metropolitan Transportation Authority operates the Metro-North Railroad, the second-largest commuter railroad in the nation. The Metro-North main lines — the Hudson, Harlem, and New Haven — run northward from New York City’s Grand Central Terminal into suburban New York and Connecticut.